Dishy News - A Transferware Blog: TEN THOUSAND PATTERNS! 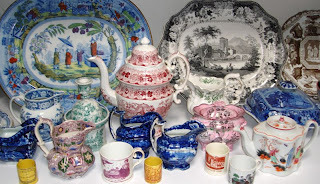 The Transferware Collectors Club Pattern and Source Print Database published its 10,000th pattern on Wednesday, February 28, 2013! The milestone lasted a millisecond, as by the end of the day there were 10,007 patterns. Thank you to the category editors and general editor Connie Rogers. The TCC Pattern and Source Print Database is available to all TCC members (annual membership is $50 for the U. S. and $60 International). Go to the TCC link on the column to the right of this blog to see details about membership. You can also look at database samples.